Home > Health & Drug Prevention > Well-Rouded Diet. Good nutrition starts with a well-rounded diet consisting of fruits and vegetables. Proper rest has a direct effect on student performance. Students do better on tests with 8 hours of rest. Students achieve better success with proper rest. Sleep 8 hours at night to be your best. Stress the importance of "smart" food choices. 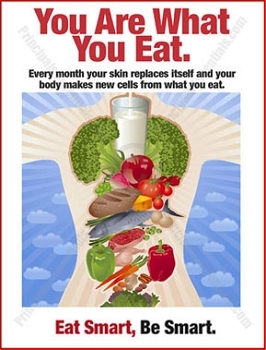 Better nutrition is the best school of thought. Encourage students to make healthier food choices. Fuel a students breakfast diet with healthier choices. Give sound advice about the importance of regular exercise. Help students lower their risk of obesity while improving academic performance. Educate students on the importance of exercising. Encourage regular exercise to boost health. Stress the importance of maintaining a healthy weight. Hand washing is an easy way to prevent the spread of germs. 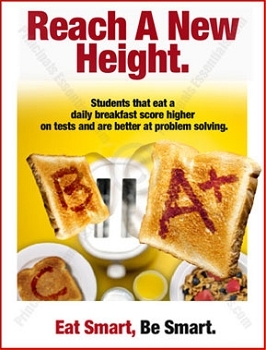 Eating breakfast can help improve academic performance. Start a nutrition awareness program in your school. Educate students on the importance of proper nutrition. Encourage students to get out and play this summer. 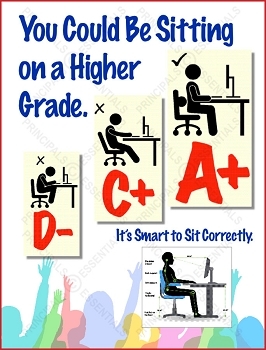 Students achieve better grades through sitting posture.